CSL wants to help our partners overcome the PRICE barrier for new installations. We are offering special pricing on our CS468 high performance RFID reader bundled with the CS790 antenna to our partner network. To find out more or become a partner, please contact info@convergence.com.hk for more details. Beyond RFID in apparel, China's ISA Boutique measures customer interaction within its jewelry department with a radio frequency identification Smart Shelve System by Alpha Solutions. 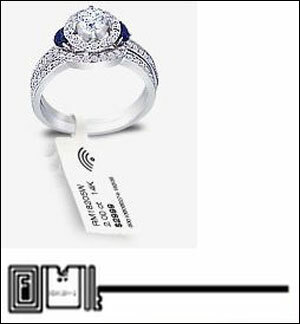 The RFID readers and antennas, supplied by Convergence Systems Ltd. (CSL), enables the store to track its fine jewelry and to know not only what is stocked within the cabinets, but also when a particular piece is removed from the cabinet and returned—and how often. Beyond inventory tracking and POS data, the RFID Smart Shelf analytics show how well customers like each item and helps determine ways to increase sales. ISA Boutique has recouped its RFID investment through higher sales, based on fewer out-of-stocks. To fully implement either a jewelry, watch or eyewear retail store similar to ISA’s installation size, the total cost is less than $7,500 turnkey package - that includes all the RFID readers, antennas, cables and application software. The ISA Boutique RFID system contains a single 16-port CS468 RFID reader and a total of 16 CS790 ultra-thin RFID antennas—one for each of the reader‘s port. The antennas were situated on the cabinet’s shelving on which trays filled with jewelry are placed. Automate time-consuming and error-prone manual processes by storing asset ID, QC and history with RFID. Streamline automated production lines for greater efficiency with RFID tagged Work-In-Progress assemblies. Early warning of corrosion or environmental stress in critical materials with RFID + Sensor tagged parts. Assure authenticity of industrial components subject to counterfeiting with RFID anti-counterfeit labels.